Once again Christmas has roared to a screeching halt. Time to pluck off the ornaments and rake up the mountainous rubble of shredded paper underneath the tree. Although we must say goodbye to the decorations, fat-riddled goodies and yes, even the falalala Lifetime movies, there’s no reason to stop reading Christmassy stories! 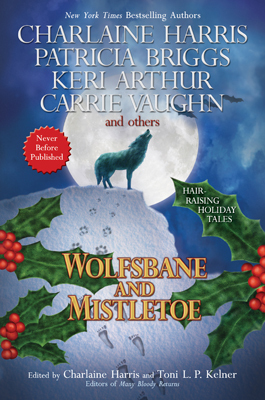 If you, like me, need something to stave off those post-holiday blues, you should pick up “Wolfsbane and Mistletoe,” a holiday feast of 15 short stories filled with werewolves, shapeshifters, vampires and oodles of romance! I’d like to give you mini-reviews for all 15, but that could take all day and I have some after-Christmas shopping to do! Here’s a taste of three of my favorites. When Robert Westin Smith attends his first Shapeshifters Anonymous meeting, he discovers Santa has a dark side – close ties with Satan to be exact. The not-so-jolly old elf teamed up with none other than Lucifer himself to rid the world of therianathropes, a special breed of shapeshifters with an appetite for evildoers. With his “salvation army” of demonic bell-ringing elves, Santa leaves toys as consolation prizes for children after devouring their parents. Wow – and I thought Billy Bob Thornton was a bad Santa! Things really get ridiculous when Santa and his band of minions swoop in on the goofy group of shifters to systematically wipe them off his naughty list. I’m not sure what’s funnier about this story, the were-tortoise shouting “man your battle stations” or a wannabe shapeshifter who likes to dance in a hypo costume. Either way, this twisted-beyond-belief holiday tale is sure to tickle your funny bone! For many happy couples, Christmas is the most wonderful time of the year. But for Sookie Stackhouse, it’s downright depressing. Sad, single and alone on Christmas Eve, she can’t stop brooding over her string of fanged and furry ex-boyfriends. Like a gift from the paranormal gods – or perhaps a well-meaning relative – a wounded, naked were-man is left for dead in the winter-bare forest surrounding Sookie’s house. Never one to turn away from a stray were-man (who just so happens to be smoking hot), Sookie wraps him in a blanket and nurses him back to health – and boy does she have good bedside manner! If you aren’t up to date on the series, you may want to catch up before reading this little story because it contains some major spoilers. This Christmas isn’t so merry for Hannah. Rather than cozying up by the fire with a tall glass of eggnog, she must brave a snowstorm dressed in a skimpy elf costume – jingle bell shoes and all –to hunt down a vampire serial killer with a penchant for Christmas charity collectors. But the humiliating costume and the unrelenting snowstorm isn’t the worst of it. She’s forced to partner up with hunky Brodie James, werewolf expert and chief investigator for Para-Investigations Squad. Owner of a killer smile and smoldering eyes. And the man who broke her heart precisely one year ago. Frostbite and bloodthirsty vampires are the least of Hannah’s worries when Brodie attempts to lure her out of her elf costume and into his bed. Out of all the stories in this collection, this one’s the hottest! I recommend reading this with a hot toddy and a decadent slice of chocolate cake. Posted on December 26, 2010 by Bubble Bubble Books and Trouble •	This entry was posted in Adult Fiction, Adult Paranormal, Romance, Vampires, Werewolves and tagged Charlaine Harris, JA Konrath, Keri Arthur, Sookie Stackhouse, Toni L.P. Kelmer, Trueblood, Wolfsbane and Mistletoe. Bookmark the permalink.